The Jomtien Boathouse stands as a monument to hard work and an unshakeable belief in one’s self. I remember it being built, with Kanikar Ottesen on the building site every day as project manager as well as everything else, saying it would open on time. This was on a Wednesday and there was no hope of that happening in three days. The Jomtien Boathouse opened on the Saturday, as she said, complete with palm trees! And that was 10 years ago. The Boathouse restaurant is very easy to find on Jomtien Beach Road, on the corner of Soi 8 and is on the ground floor of the Jomtien Boathouse Hotel, which has 24 top class rooms available for rental, into which we have put many guests over the years. 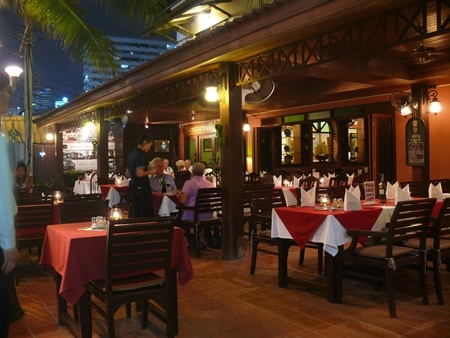 The Boathouse restaurant is very easy to find on Jomtien Beach Road, on the corner of Soi 8. The restaurant area is divided into three, with an air-conditioned inside section, which has its own bar and performing stage, and the outside covered area facing the sea and relying on the cooling breezes from the Gulf of Thailand. This second area also has the third section which is a sit-up bar where you can oversee Jomtien Beach Road. We chose the outside area as the sea breezes really were cool, and it was notable that the vast majority of the diners chose this area as well. With a reasonable percentage of the diners being either Scandinavian or Russian, the menu is a totally photographic one. This is something that all restaurants should do in a holiday resort area such as ours. The brochettes are more like swords than skewers. The menu starts with the Boathouse’s Prawn Promotions (B. 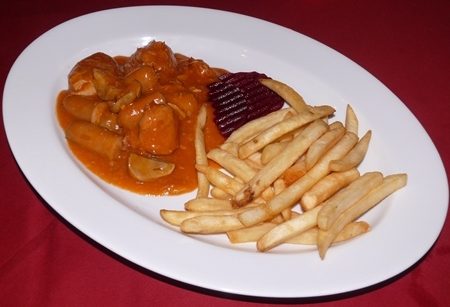 240) which features amongst others, prawns done in garlic, or in a curry sauce or cheese. Next up is the most popular dish on the menu, fish and chips and at B. 199 a bargain. Also on this page is the famous Thai soup tom yam goong (B. 195). The next section is Appetizers, and again not expensive at B. 90-170. The items here include spring rolls, salmon and asparagus rolls and mussels in garlic butter. Next up are Starters (B. 140-190) headed by an oxtail soup and minced chicken meatballs. Dinners (B. 220-365) and these include a duck breast (B. 295), half a chicken (B. 275) and a pork tenderloin casserole (B. 295). The next item is a page of Brochettes (B. 310-475). On a previous review I mentioned that these were not really skewers, but were more like swords. It is the same today, with the Surf and Turf (B. 395) looking very inviting. 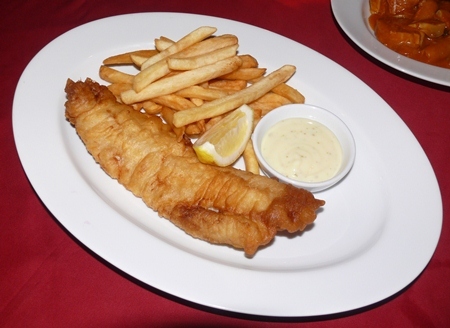 The most popular dish on the menu is fish and chips. With the high numbers of Scandinavians, there are some Scandinavian dishes (B. 265) such as Danish meat balls with potato and red cabbage and fried pork in parsley sauce. Of course there are all the Thai favorites as well (B. 160-395), so Thai partners are also catered for. Something you do not see too often is Tapas (B. 125-320) and this ‘nibble food’ includes prawns, chicken, mussels, meat balls and salmon. Pizzas are up next (B. 250-295) and includes all the usual toppings. The menu is not over yet, with children getting their own choices (B. 150), followed by Sandwiches and Burgers (B. 130-190) then desserts and Irish coffee (B. 185). Wines are on a separate menu with the majority around B. 1,000 from the new and old worlds. 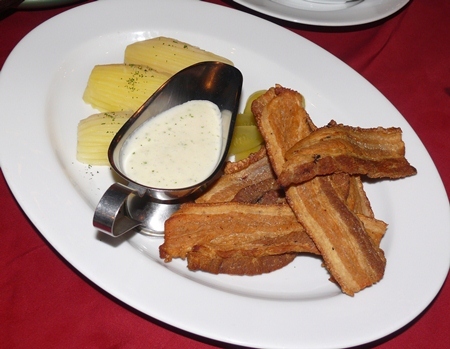 Kannikar was insistent that we try more than one dish and in very quick order we were regaled with a steak brochette, a fish and chips, the pork tenderloin casserole, a Danish fried pork in parsley sauce and a Pizza Margherita. 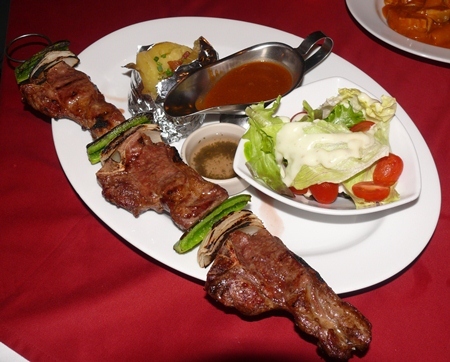 The sheer size of the portions becomes apparent when the dish arrives at the table. Scandinavians are known for their large appetites, and they do not leave the Jomtien Boathouse hungry. All of our dishes were correctly cooked and were most enjoyable. A great evening and highly recommended with great value for money. The Jomtien Boathouse, Hotel, Wine and Grill; Jomtien Beach Road (corner Soi 8), telephone 038 756 698, fax 038 756 144, email info @jomtien-boathouse.com, website www.jomtien-boathouse.com. Open seven days, 8 a.m. until 11.30 p.m. Breakfast from 8 a.m., lunch 11 a.m. till 6 p.m. and dinner from 6 p.m. until late. Entertainment by “Elvis” on Monday and Tuesday evenings. On street parking.